Time is a mom’s greatest commodity. Use these time saving hacks to make the most of yours. Two of the biggest chores that are never ending for a mom are grocery shopping and laundry. Use these simple steps to give you more time in your day to enjoy the things you really love. One of the best things I have figured out in the past decade is how to create systems that work for our family. Too often I found myself feeling overwhelmed with the simplest things as a first time mom. This is laughable to me now because I didn’t have THAT much on my plate, but it felt like the heaviest load because I hadn’t figured out my own groove yet. Despite only having one child to feed and take care of through out the day I didn’t know how to best use my time. Her wise advice? BAM. Sisters are the best. I started slow and found that at the time one load of laundry a day was a good routine for me. I made it a goal to unload and fold that one load of laundry as it came out of the dryer. It worked. I felt confident. We had a small washer and dryer but it worked well enough and I could maintain this pace. Meal planning was another fiasco and I DREADED taking my kids to the grocery store. Someone was bound to need a diaper change, want a cookie, or demand a special treatment of some kind. My husband and I found that things went a lot more smoothly if he picked up the groceries. This was wonderful of him to offer, but sometimes I wouldn’t get exactly what I was hoping for or he couldn’t find everything I needed to make a recipe. Fast forward 10 years and my life and routines are completely different and SO MUCH BETTER thanks to online grocery shopping and Walmart Grocery Pick-up. There are so many conveniences that did NOT exist when I started this motherhood gig. 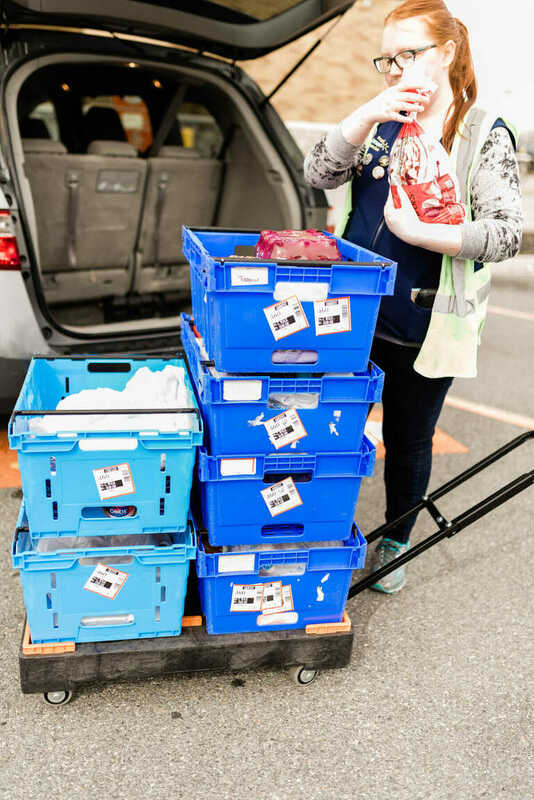 Walmart grocery pickup has changed the game big time; I am admittedly a huge fan and wrote even more about it here. How does online grocery shopping change your life? You can order your grocery list with all the recipes right in front of you from the comfort of your own home. No more wandering up and down the aisle looking for that one evasive ingredient. You can set a time to pick up your food and it is all bagged up and ready for you. If there are any items out of stock at Walmart that are on your list Walmart will replace them with something comparable or better for the same cost. You can make modifications within a short period after ordering the food. You can order food items AND nonfood items. Think birthday gifts, holidays cleaning supplies, and home goods. I regularly buy holiday items in advance from Walmart Grocery Pick-up because I can keep it a surprise without having to take my kids to the store. How Can Laundry Routines help me save time? Find a laundry routine that works best for you and your family. This could be doing one load daily or all loads one day a week. Use products that save you time and do the job well like the new, improved Tide PODS® available at Walmart. They’re a 4-in-1 laundry solution with concentrated Tide detergent, extra odor fighters, extra stain fighters, and built-in pre-treaters. And they’re so easy to use! Just toss one or two in the drum before you add your clothes – no measuring or messes. Use products that protect your clothes and keep them looking newer, longer like Downy Liquid Fabric Conditioner. Get more scent for your buck by using Downy Unstopables that will give your laundry up to 12 weeks of freshness. Simply add the beads to your washer before clothes — and there are lots of scents to choose from! We love using Bounce dryer sheets that fight static and wrinkles for less ironing time. You can find all of these items using Walmart Online Grocery Pickup! Just go to grocery.walmart.com or download the Walmart Grocery app, search for these products, select your pickup time, and check out! You can add all these items in my laundry regimen to your order by clicking here. For us, I have found that I now like to order my groceries on Sunday night to have them ready on Monday morning after I drop the kids off to school. It is a fresh start and gives me the weekend to run inventory and make up a menu for the week. We now save laundry for the weekend and get all of it done instead of going day to day. I found this works better for me because throughout the week I tend to forget when I have started a load of laundry and I ended up having to do the same load over and over again. What works best for you? 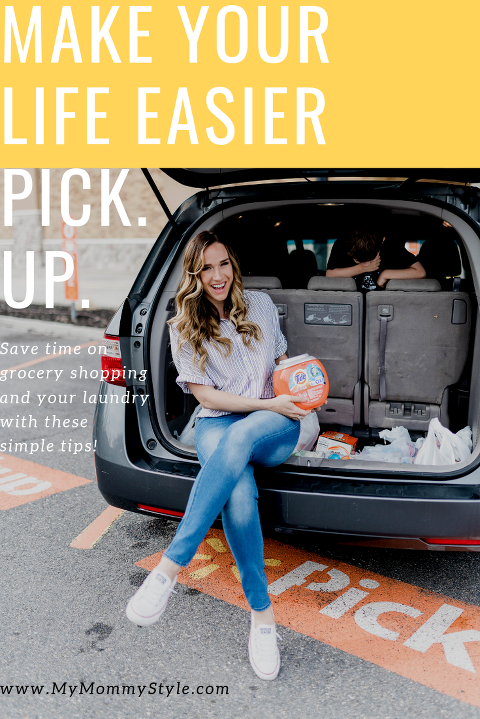 Have you tried Walmart Grocery Pick-up and Tide PODS? If you haven’t please tell me WHAT is stopping you! You will never be the same again!